She is as polarizing and nearly as popular as her mom, and now millions of fans of Bristol Palin, daughter of former Republican Vice Presidential candidate Sarah Palin, will hear what life is really like for this twenty year old single mother of a two year old boy. For the first time, Bristol shares the intimate behind the scenes drama in her life, from growing up in Alaska to coming of age when her mother begins to rise in the political landscape, from dealing with a teen pregnancy in the spotlight of the Republican National Convention to coping as a single mother when her relationship with her baby’s father crumbles publicly, not once, but twice. The tabloids have had a heyday with Bristol and yet she’s never spoken at length to the press about any of these high profile events, including how she maintained her composure when she faced criticism and even threats of physical violence as a contestant and finalist on Dancing with the Stars. An advocate for young girls everywhere Bristol will delve into all of these topics and more. From body image to the Tea Party, how does one very young woman under the glare of an often nasty media spotlight handle the pressure without losing her mind, her faith, and her friends? Bristol first entered the national spotlight when her mother, former Governor of Alaska, Sarah Palin was selected to be John McCain’s running mate in the 2008 Presidential election. Bristol traveled the country alongside her mother, father and siblings on the campaign trail. After giving birth to her son Tripp, and becoming a single teen mother in 2008, Palin became a spokesperson for the prevention of teen pregnancy and other teen issues. As an advocate for the protection of life, Palin wanted to share her story with other teens who may one day face a similar situation. Palin also acts as Teen Ambassador for The Candie’s Foundation, to prevent teen and unplanned pregnancy. As part of her campaign, Palin recently guest starred as herself on an episode of ABC Family’s teenage drama The Secret Life of the American Teenager. Palin resides in Alaska with her son and family. Alaskans4Palin congratulates Bristol on this new journey in her life! Weigel “Take Away the 7,582 Waukesha votes and Kloppenburg Wins.”Lib Spin At It’s Most Laughable. Weigal over at Slate has found a way to spin the Dem’s Wisconsin judicial election loss just finalized today-by magic! If they simply deduct all Judge Prosser’s winning margin from the Republican leaning Waukesha County from his total then-hooray-Kloppenburg wins! It’s as simple as that. Actually that’s fine by me-let’s give him that in exchange for deducting Obama’s winning margin over McCain which is a fine swap which, according to today’s Gallup poll which puts Obama at his all time low, the country would be happy to bargain for. I am confident Judge Prosser who seems a dignified gentleman who would put his country first would be happy to stand aside for such a plan. The liberal media advised that the judicial election was to be a referendum on Governor Walker’s budget,the Tea party and Palin,who alone amongst the possible presidential candidates had the guts to endorse Prosser. Now that it hasn’t turned out as they expected this “highly significant election ” has disappeared from their talking points-except to arise in their fantasies of victory by deduction. A good polling/election result day for conservatives. 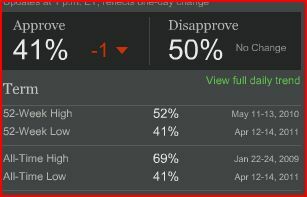 President Obama hits his 52 week low and ties for his all time low at 41% in Gallup. This represents an astonishing 28 point drop from his all time high. If this held up through election year Florida/Ohio/Colorado/Virginia would be lost to him and he would be defeated. Even Pennsylvania could go which would be approaching landslide territory. In Wisconsin’s judicial election Judge David Prosser,who was endorsed by Sarah Palin, has won the canvass of election results comfortably. This was a referendum on Governor Walkers budget and union proposals, the Tea Party and Palin’s power as an endorser-all won and the Dem’s/unions lost. “MADISON, Wis. (AP) — Results from Wisconsin counties show a conservative state Supreme Court justice has won re-election in a race seen as a referendum on Republican Gov. Scott Walker’s divisive union rights law. Many are reporting that Palin’s star is fading, but the former Alaska governor will be front and center as she heads to Wisconsin this Saturday. Never one to back down from a battle, Palin will head right to the scene where protests at the State Capitol pitted Democrats against tea-party inspired Republicans in a political drama followed across the country. Palin aide Rebecca Mansour confirmed on Twitter Thursday that Palin is set to speak at the tea party’s annual tax day rally, which begins at noon Saturday in Madison. Palin has consistently weighed in on the Wisconsin debate, calling on union bosses to turn down the rhetoric and arguing that Wisconsin has been “strategically picked” by Democrats and their labor allies as a must-win political battle. Palin also encouraged her followers in Wisconsin to vote for Republican-backed Justice David Prosser, the unofficial victor in this month’s state Supreme Court election. However, Palin won’t receive a warm welcome from everyone, including the Wisconsin Democratic Party Chair Mike Tate, who immediately sent out a statement criticizing both Palin and Walker. On a side note, potential 2012 contender Donald Trump will also speak at a Tea Party rally on Saturday in Boca Raton, Florida. The Florida event is the Tea Party group’s 3rd annual Tax Day rally, planned for Boca Raton’s Sanborn Square. In 2008, Sarah Palin excited conservatives nationwide as she burst onto the scene as McCain’s vice presidential candidate, but with 2012 around the corner, Palin supporters now have their eyes set on a different goal—the presidency. Grassroots movements are popping up everywhere to give Palin their full support and one of those groups is Youth for Palin. It’s important for a candidate to capture the attention of youth and although Youth for Palin is not directly affiliated with a Palin campaign, it’s apparent members are preparing for an announcement by the former Governor. Formed in March of 2011, Rollan Ross realized his dream of bringing youths together with one voice and he visualizes an ever-increasing group of young conservatives who will not only speak up, but be heard. I had the fortunate opportunity to interview Elizabeth Hawkes, co-founder and administrator of “Youth for Palin,” where I was able to learn more about the group, its focus and goals. Why did you create Youth for Palin? “Youth for Palin”, a grassroots movement of conscientious young people, is gaining strength as a conservative force and powerful voting block. At the center of this youth movement is their political idol, Sarah Palin, a constitutional conservative, with values and ideals that reflect their own.Though not directly affiliated with her campaign, “Youth for Palin” members, having given their full support, are a ready army of young and loyal followers awaiting marching orders when Sarah Palin announces her nomination for President. Why is it important to implement strong conservative values to our youth? Their founder, retired businessman and entrepreneur, Rollan Ross, has a heart for organizing and mentoring young people and is an outspoken conservative supporter in his own right. In March of 2011, he started an enthusiastic Facebook group comprised mostly of motivated youths and a handful of adults giving guidance and support. His dream of bringing youths together with one voice has been realized in “Youth for Palin”. Rollan believes that the success of the group stems from the young conservatives themselves. “Our young members”, Rollan states, “are thirsty to engage in political discussions, meet like-minded peers, and challenge each other through teamwork to bring about conservative awareness and hands on participation in changing the political landscape for the better”. What can members of Youth for Palin expect? The fact is, “Youth for Palin” members are a committed and politically aware group of young people, one in which Sarah Palin herself would be very proud of for voicing their patriotic love for country and concern for their own futures. What’s next? Rollan visualizes an ever increasing electrified atmosphere of active youth supporting Sarah Palin and cementing their own desires for becoming future political leaders. Fifteen year old high school student, Madeleine McAulay, the group’s Chief Moderator on Facebook and young conservative, has spear-headed a number of successful drives to increase membership and promote the groups sole purpose of helping elect Sarah Palin and educating young conservatives. Under her leadership, “Youth for Palin” has contacted many fellow conservative groups along with radio shows, Glenn Beck, Laura Ingram, Rush Limbaugh, and Michelle McCormick. “As of now”, Madeleine states, “we have a few newspapers doing advertisement for us along with having flyer weekends; putting up Youth For Palin Flyers”. In fact, when Youth for Palin members go out into their local communities to post flyers they carry with them voter registration forms to encourage those who are not registered to get out and vote and make a difference. From the very beginning, Madeleine showed great leadership skills. Almost immediately after joining the administration staff of the group’s Facebook page, Madeleine produced a “Youth for Palin” promo video encouraging kids to join the group. She is also involved in starting Palin groups in each state to ensure that if Sarah Palin runs, she will be fully supported. Madeleine has already contacted several of her State Representatives and the feedback was all positive for using the group’s membership to get the youth vote for Sarah. For those interested in joining Youth for Palin, how does one become a member? All future 15 to 24 year old “Youth for Palin” members are encouraged to participate by going to the group’s “Youth for Palin” Facebook page and requesting to join. Trump shows the utter paucity of the rest of the GOP presidential candidate field. Trump will take enough support from Romney so as to deny him the nomination and since Trump won’t get it it either one of the “radicals” will ensuring Obama’s re-election. Trump has finished off Palin as a force to be reckoned with for 2012. The latest thought to capture their minds is that if Trump doesn’t get the nomination, and runs as and Independent, then President Obama is guaranteed to be re-elected because of the split on the right. We’ve heard this sort of scenario before of course. On the left President Truman was totally written off because, not only was there a plausible mainstream Republican candidate opposing him, but the Democrats were split into their Southern wing with Thurmond running on a States Rights ticket, and their Progressive wing with former VP Henry Wallace running against him. The election turned out to not be even close, with Truman getting just under 50% of the popular vote, and winning in a landslide in the Electoral College 303 to 189. The two parties that split from the Dem’s got 2.4% of the vote each with Thurmond picking up only 4 states in the deep south. More to the point the election of 1980 saw a breakaway from the Republicans, with Congressman John Anderson making a run against Reagan from the left of the GOP. At the height of the Anderson movement he received 20% in the polls, which if actually obtained on election day, would have destroyed Reagan’s chances against Carter. Even though Anderson participated in debates with Reagan, and had the support of the influential cartoonist Garry Trudeau via his nationally syndicated “Doonesbury” cartoon, come election day Anderson garnered only 6.6% of the popular vote. That is a significant number, in that the thinking has been that if a third party draws 5% they would garner enough to severely damage the mainstream party they broke away from. As for the Perot campaign analysts have demonstrated emphatically that he took votes equally from President Bush and Bill Clinton. His campaign again proves that when the public is ready for a change they will ensure that it comes about through a mainstream party. The third party election campaign with the other Wallace, George in 1968, again goes to confirm that nothing can go against the mood for change. Even if all of Wallace’s 46 electoral votes from the deep south were added to those of Hubert Humphrey, which is very doubtful considering all those states went to Nixon in 1972, Humphrey still would have lost by a substantial margin in the Electoral College. Even though running against a sitting president, and with the Republicans split and with Reagan, who was at one point 34 % behind Carter in the election year polls, subject to the same ridicule that the media have subjected Palin to the result was a huge landslide. Reagan received nearly 51% of the popular vote to Carter’s 41% and destroyed Carter in the Electoral College 489 votes to 49 (44 states to 6). History clearly shows that if Trump does decide on a quixotic run there is no reason for the GOP to have undue fear of that course of events. In fact, given that he has stated he would do exactly that if he is denied the nomination, the Republicans should, right now, exclude him from the campaign process .